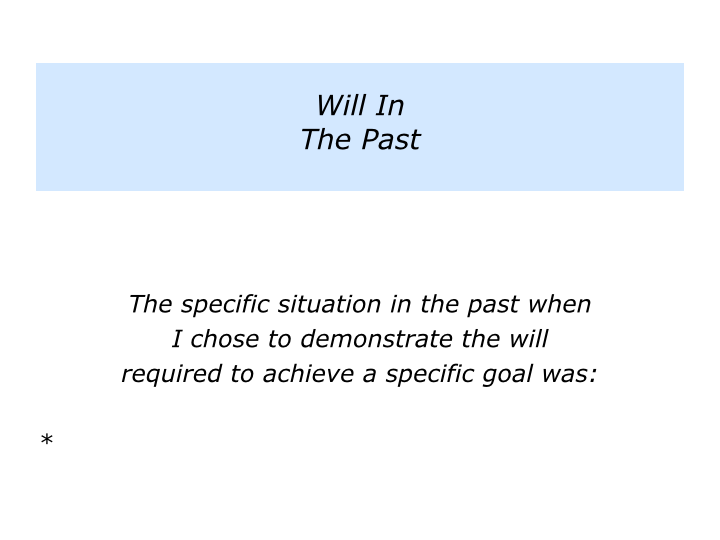 Looking back on your life, can you think of a time when you demonstrated the will required to achieve a specific goal? You may have been aiming to pass your driving test, save money for your first home, regain your health or achieve another aim. Your will to achieve it was probably at least 8+/10. The person must have the will before you can help them to learn the skill. People are prepared to do things they don’t like doing – providing they can see the meaning. They want to see how what they are doing will contribute to them – or others – achieving a higher purpose. Where there’s a way, there’s a will. If you wish, try tackling the exercise on this theme. This invites you to look back on your life and do the following things. 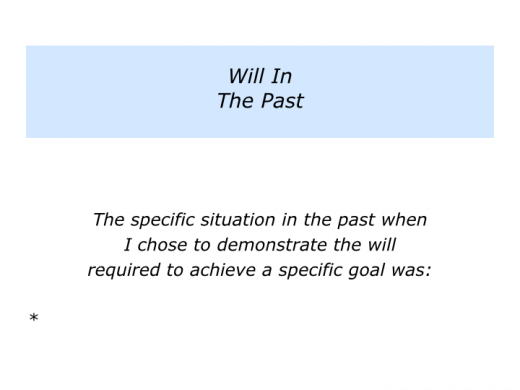 Describe a specific situation in the past when you chose to demonstrate the will required to achieve a specific goal. 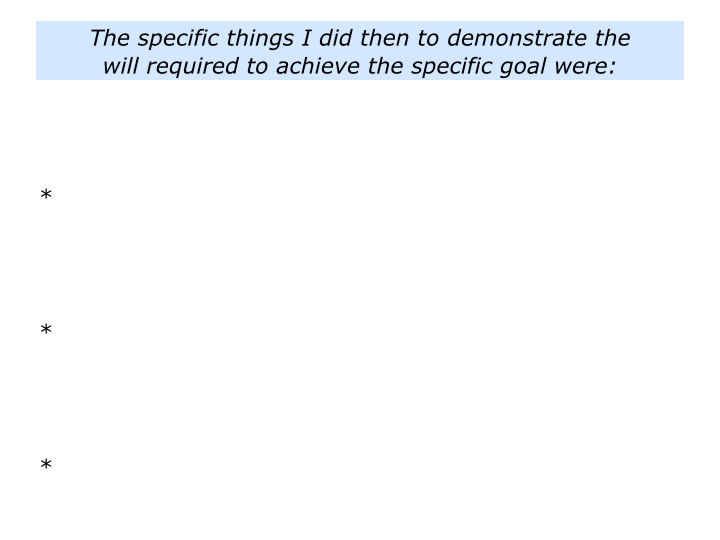 Describe the specific things you did to demonstrate the will required to achieve the goal. 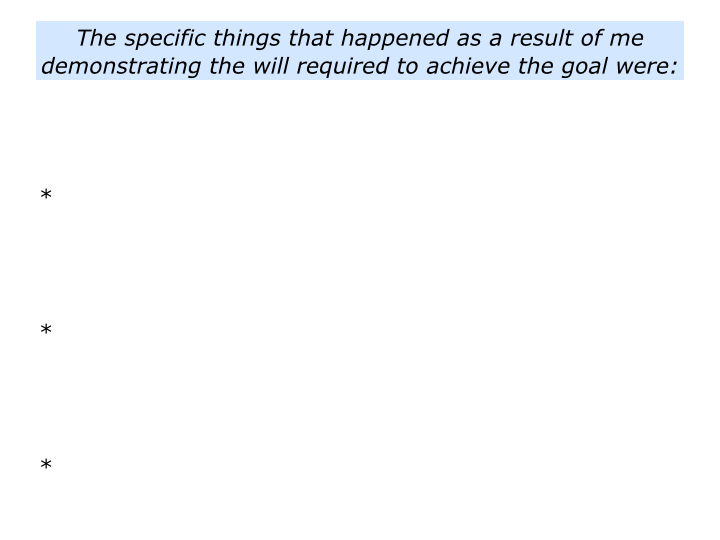 Describe the specific things that happened as a result of demonstrating the will required to achieve the goal. If you work in any field involving helping people, you will probably start by creating an encouraging environment. You will then encourage them to set positive goals. One approach is to ask people some of the following questions. You may ask these whether working with individuals, teams or organisations. 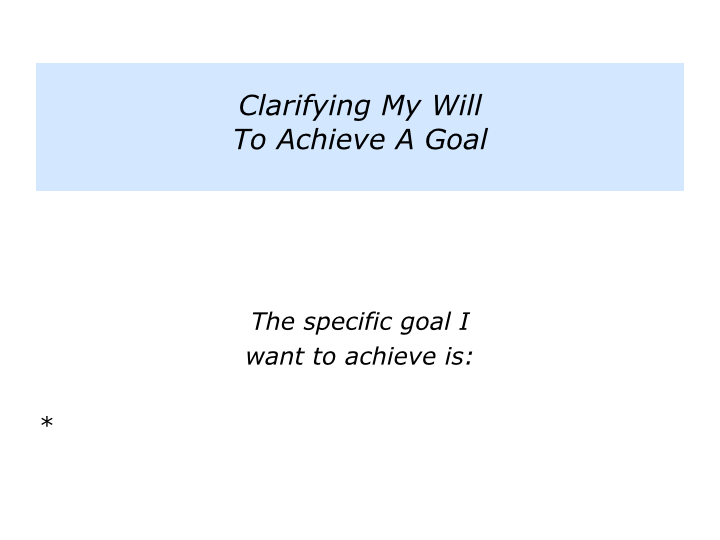 What is the specific goal you want to achieve? What are the real results you want to achieve? What is the picture of success? How can you do your best to achieve the goal? What are the key strategies you can follow to give yourself the greatest chance of success? How can you get some early successes? 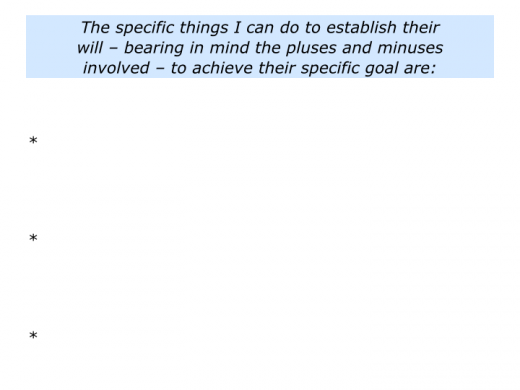 What will be the pluses of achieving the goal? What will be the benefits both for you and for other people? What will you be feeling, thinking and saying after you have achieved the goal? 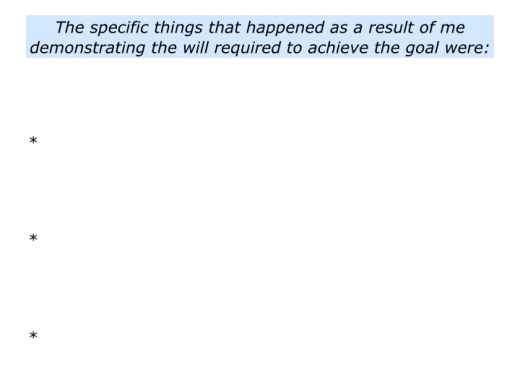 What may be the potential minuses involved on the way towards achieving the goal? How can you build on the pluses and minimise the minuses? Bearing these things in mind, are you serious? 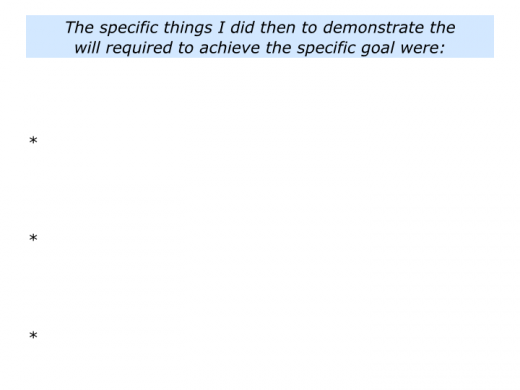 Do you really want to do the work involved in achieving the goal? On a scale 0 – 10, how strong is your will to reach the goal? Looking at my own work, for example, I often follow The Positive Approach. This starts by helping people, teams and organisations to clarify their picture of success. We then look at when they have built on their strengths and followed their successful style. This often creates an environment in which people feel they have the ability to achieve their goals. The next steps involve following practical strategies to do superb work, find solutions and achieve their picture of success. The positive approach is based on encouragement, but it also calls for people choosing to take responsibility. The young person much be prepared to take responsibility for shaping their future. Certainly we could encourage them and show the benefits of, for example, staying healthy, rather than taking drugs. But it had to be their decision. They had to want to achieve the goal. They had to be prepared to put in the work involved in achieving the goal. They will feel more in control. They will possibly build better relationships. They will possibly like themselves more. They will see their children and maybe grandchildren grow up. They must take responsibility every day for the rest of their lives. They must find a new purpose – other than getting a fix. They must work to get money. They must make new friends and deal with their feelings without drugs. Bearing these factors in mind, do they really want to go for the goal? The drug addict’s odyssey is one example, but every person’s journey will involve upsides and downsides. Some athletes, for example, develop a pattern of almost reaching their target. They almost win a tennis title, golf championship or whatever, but they fail at the final hurdle. “What happens if I win? Everybody will expect me to keep winning in the future. Some athletes answer “Yes”. Others may be more uncertain and this shows in their performance. Are you really serious? Are you prepared to do what is required to implement the strategy successfully? 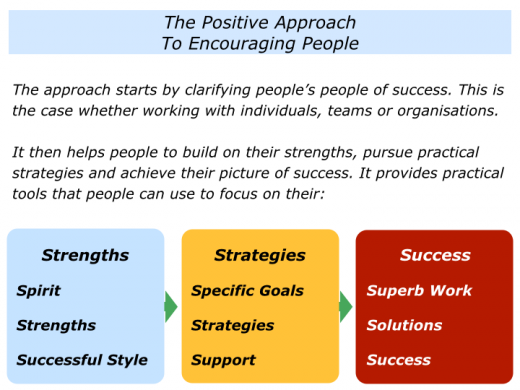 How can you build on the positive energy and positive people in the organisation? How can you get some quick successes? How can you find and share success stories that show people what good looks like? 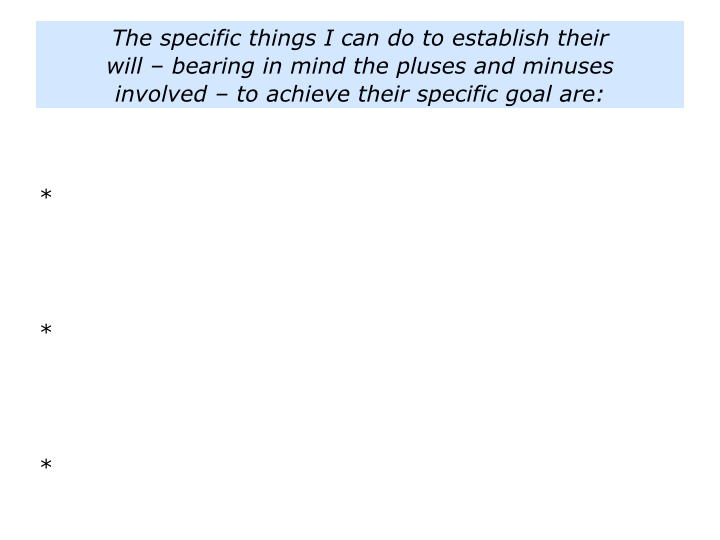 How can you build on the pluses and manage the minuses involved in working to achieve the goals? If you are doing a values programme, for example, how can you as a leadership team live the values, rather than just laminate the values? How can you encourage yourselves and other people on the way towards achieving the goals? How can you do everything possible to achieve the picture of success? On a scale 0 – 10, how serious are you about doing what is required to achieve the goals? If it is 8+/10, then let’s go for it. Whether you are working with a person, team or organisation, it can be useful to clarify how serious they are about reaching the goal. You can then help people to achieve their picture of success. 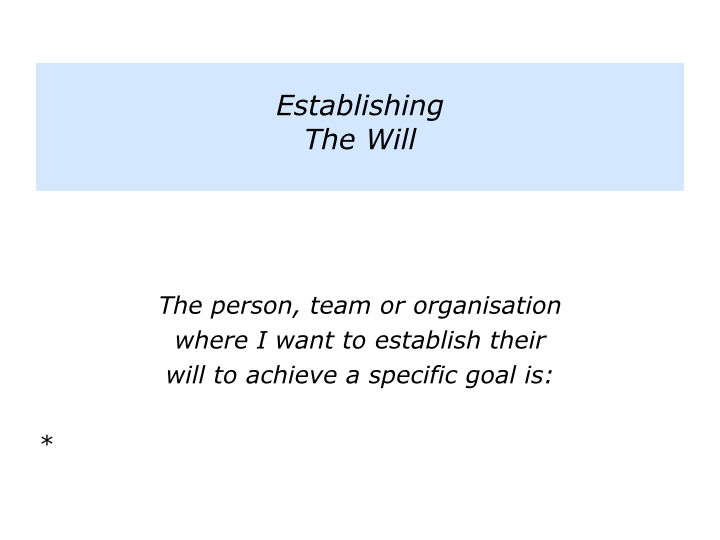 Describe a person, team or organisation where you want to establish their will to achieve a specific goal. 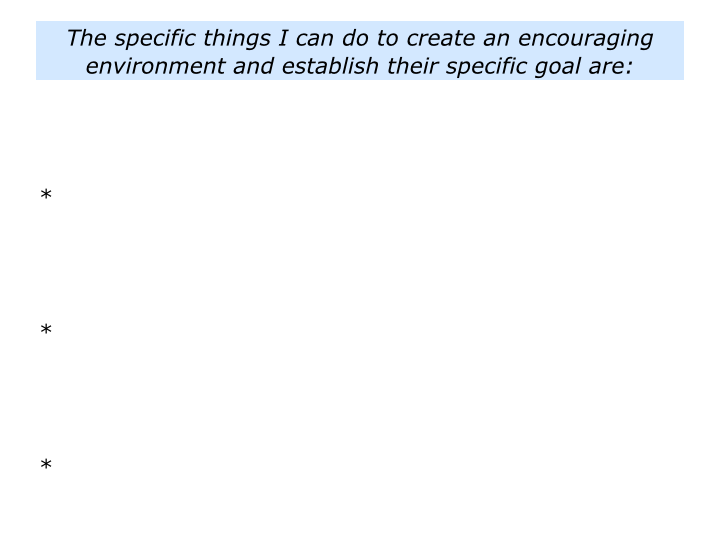 Describe the specific things you can do to create an encouraging environment and establish their specific goal. 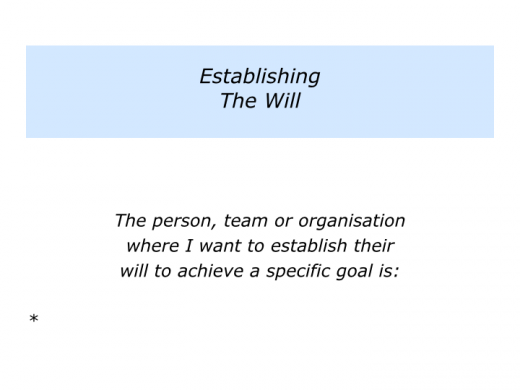 Describe the specific things you can to do establish their will – bearing in mind all the pluses and minuses involved – to achieve their specific goal. Make sure it is at least 8+/10. Describe the specific things you can then do to encourage them to maintain their will on the way towards achieving their specific goal.